Is Hello Kitty Japanese? Or British? Everybody who is really, really into Hello Kitty knows her name is Kitty White. Ditto for this: according to her official Sanrio biography, she was born in London, making her British by default, no? So what's the big deal? Yet, pretty much everyone in Japan thinks Kitty-chan is Japanese—with only diehard Hello Kitty nerds all the wiser. According to an Atlantic Wire piece by Tokyo Vice writer Jake Adelstein, Tatsuya Nakajima, a leader of the right-wing group Junshinkai, was ticked off by the assumption that Hello Kitty was not Japanese, saying, "That's the kind of stuff the Chinese say when they pirate our national treasures and goods. It's outrageous. And unforgivable." Of course, designer Yuko Shimizu created Hello Kitty in Japan in the early 1970s—though, there's been dispute that it rips off Miffy. 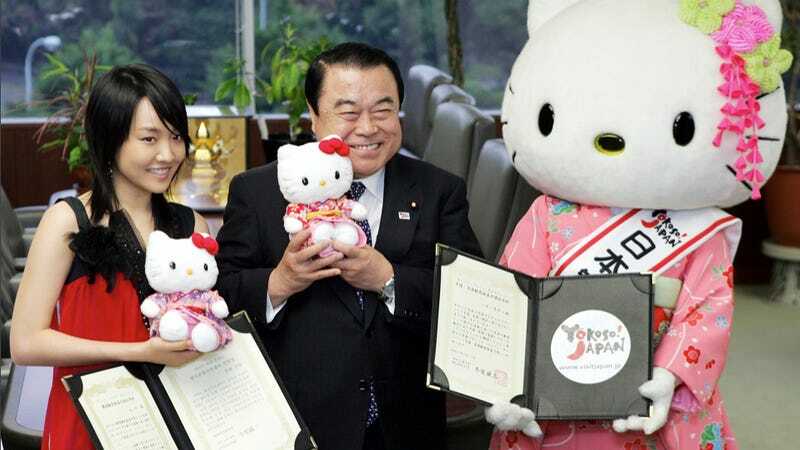 In 2008, the cat was even named Japan's "Official Tourism Ambassador". However, Hello Kitty's official profile contended that the character lived in London with her family. So...shouldn't she be a tourism ambassador for the U.K.? According to their story, Hello Kitty is introducing Japan to her American boyfriend Dear Daniel. When he arrives, he discovers Kitty living in a tatami-mat laden house. Her entire family lives in Japan and they all can read Japanese and speak the language fluently. Kitty is so knowledgeable about Japanese culture and traditions that the reader can only surmise she is either Japanese or an amazingly bilingual Japanese studies scholar. Maybe the cat is a dual citizen? There, argument settled. Phew!